The fury of flood has wrecked havoc worldwide, causing immense loss of life and property. But one aspect that has received far less attention has been the impact that floods have on animals. More often than not, these stranded hapless animals are the last ones to be rescued. We present a series of photographs when animals were caught in the fury of floods. 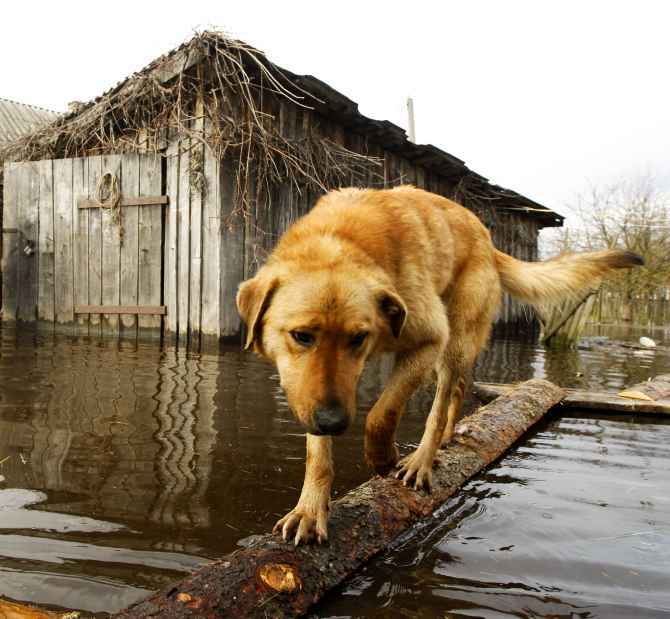 Opening photograph: A dog is seen in a flooded courtyard as water from the Prypyat river overflows its banks during spring flooding in the village of Khlupin, some 270 km south of Belarusian capital Minsk, in April, 2013. 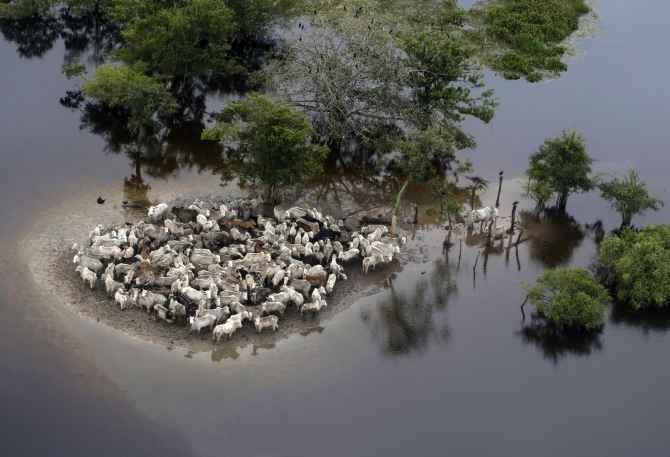 An aerial view shows stranded cattle in the flooded region of Ballivian province in the Beni department of Bolivia in February, 2014. Torrential rain and floods in Bolivia killed scores of people and left many thousands homeless. 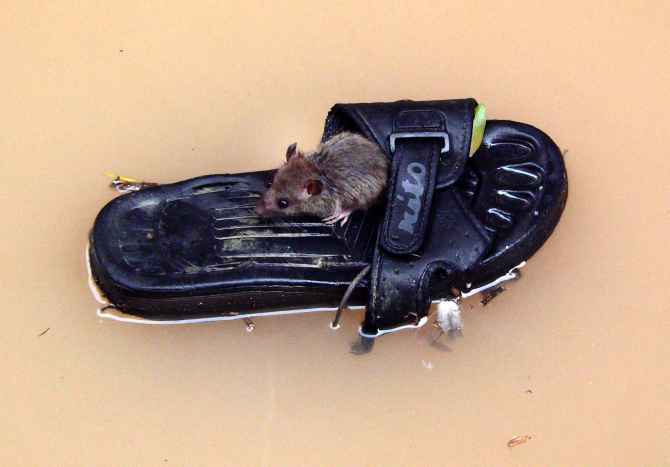 A rat floats on a slipper on a flooded street at Fuzhou in east China's Fujian province, in October, 2005. Typhoon Longwang brought heavy rain to Fuzhou and the flood submerged many low-lying areas. 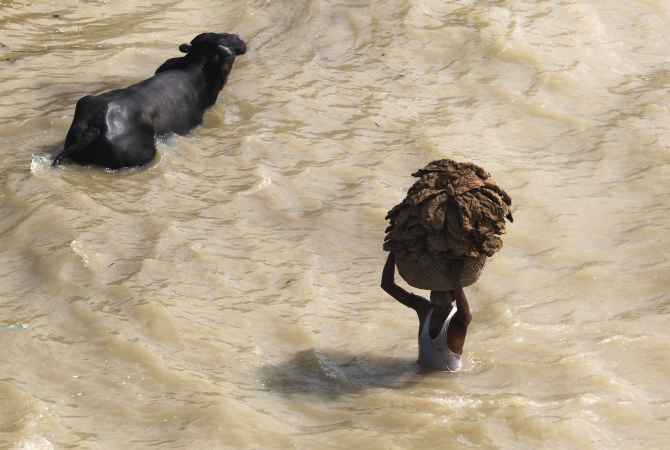 A man carries cow dung cakes in a basket as he wades through the flooded banks of Ganga in Allahabad during heavy rains in July, 2013. 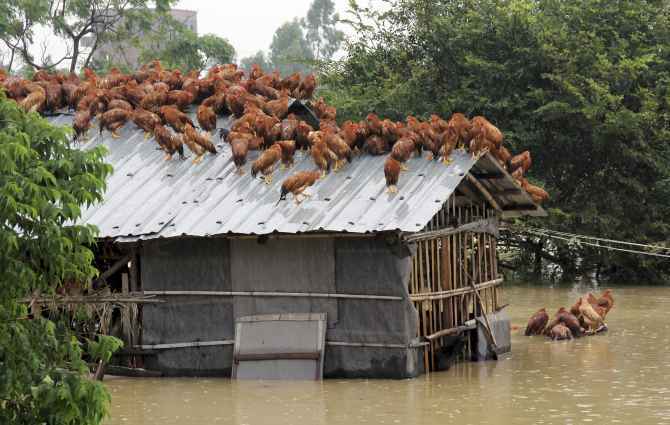 Chickens perch on the roof of a hennery to escape rising floodwaters after Typhoon Utor hit Maoming, Guangzhou province in China in August, 2013. Typhoon Utor hit China's southern Guangdong and Guangxi provinces before easing to a tropical storm. Over 158,000 people were relocated in southern China ahead of the typhoon's arrival. 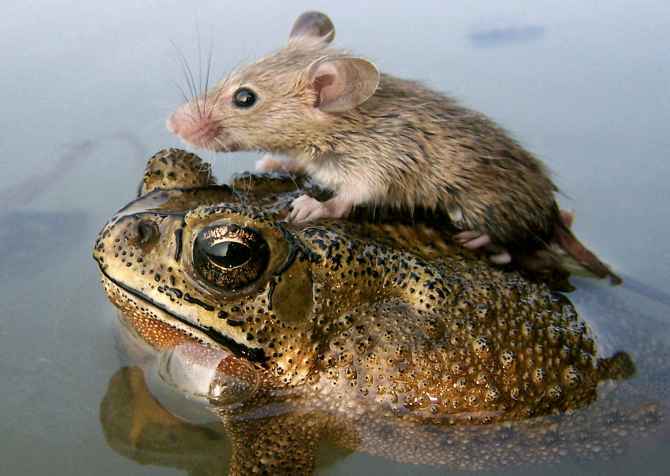 A mouse rides on the back of a frog in floodwaters in Lucknow in 2006. 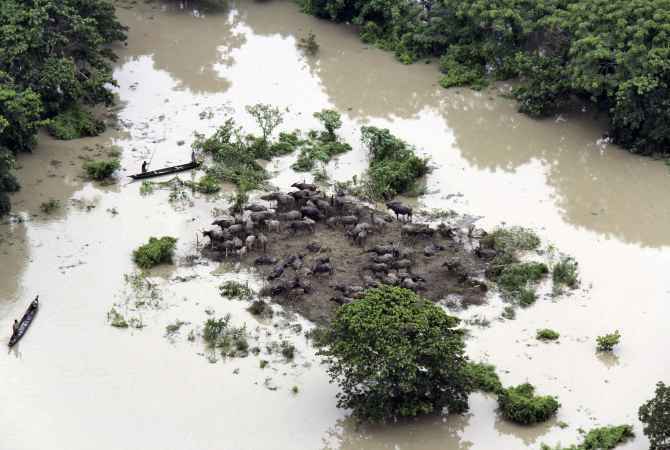 People row boats past an islet on which buffaloes have been stranded in a flooded area of the Sonitpur district in Assam during the 2012 floods. 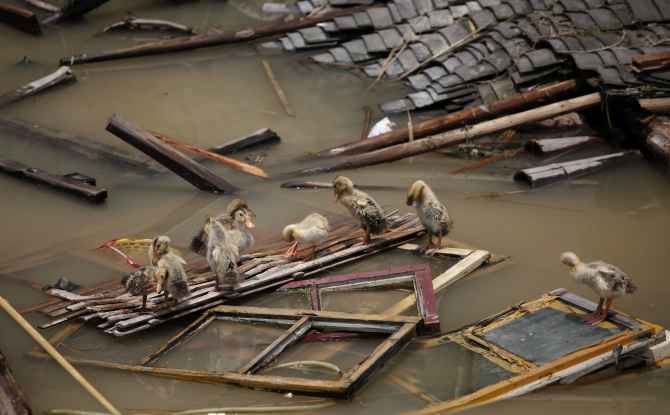 Ducks are seen on top of pieces of wood from a house damaged by the floods in Sanjiangkou village, Zhejiang province, China in June, 2011. 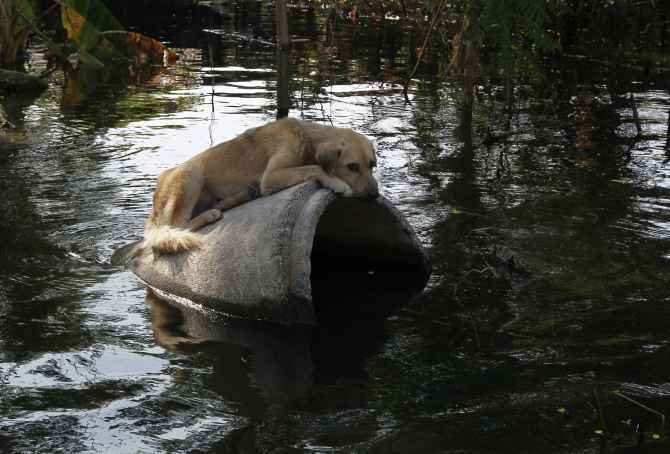 An abandoned dog sits on a concrete pipe at a flooded area in Bangkok during the 2011 floods. 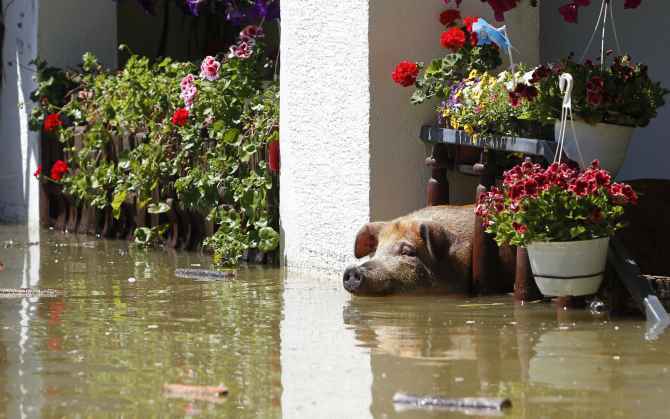 A pig waits to be rescued during heavy floods in Vojskova, Bosnia and Herzegovina in May, 2014. More than a quarter of Bosnia's four million people were affected by the worst floods to hit the Balkans in more than a century, the government had said, warning of "terrifying" destruction comparable to the country's 1992-95 war. 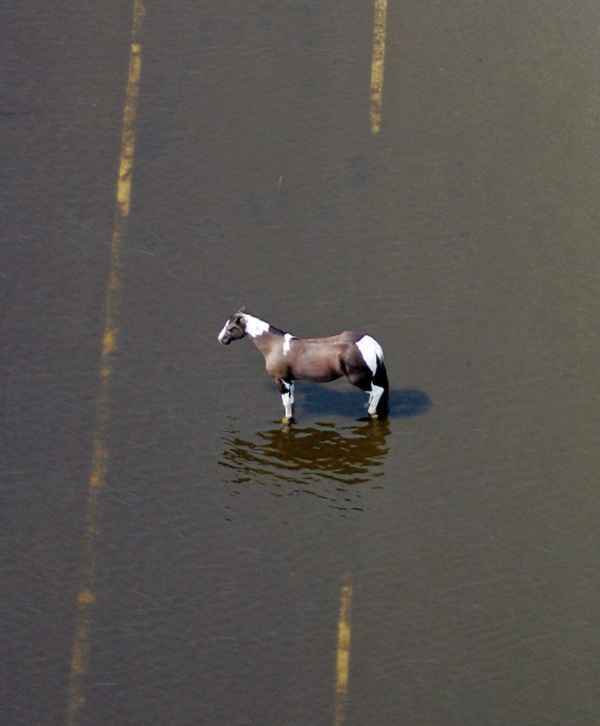 A horse stands in floodwaters from Hurricane Katrina in St. Bernard Parish near New Orleans, Louisiana, USA in September, 2005. 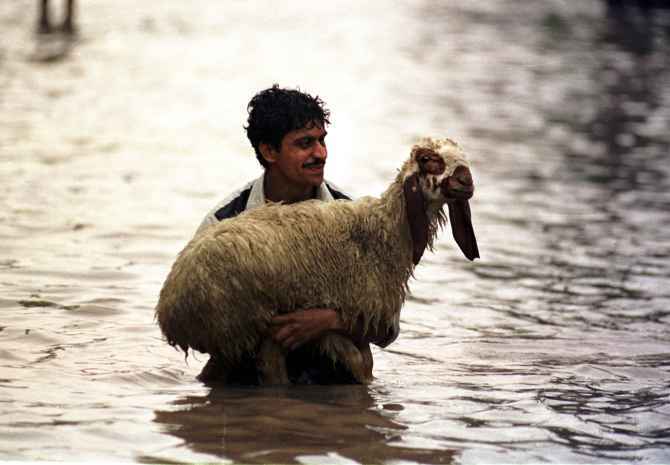 A Pakistani man carries his sheep down a flooded road after a heavy downpour in Lahore in July, 2001.